It is not about quantity – it is about quality. 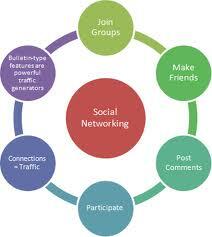 Having 2,000 contacts on LinkedIn does not necessarily mean that you are a good networker. How can you actually know all those people, and how can you keep up a dialogue? So, be picky when accepting contact requests on social networks. Try to find some common ground like people you both know or events both of you attended. And feel free to decline a request if it does not feel suitable to connect. Your network is larger than the amount of your online contacts. With the emerge of Social Networks we sometimes forget that there are still people who are not part of the buzz or at least are not part of your online activities. Still, these people belong to your network. They are your (extended) family, friends, neighbours, (ex-)colleagues, your dentist, your hairdresser etc. Do remember that there is life outside of the internet and keep in touch with these people as well. They might know you much better than your virtual friends do. Keep a social calendar and send birthday greetings to the people in your network. It is acceptable and way more personal to do so via a private message instead of posting it to a Facebook wall. If you learn that someone has a new job, take some time and write a little congrats note. Ask a question about the new job and don’t be surprised when people reply. Imagine your contact informs you that she is about to set up a new department and is looking for people to join her team. Here it is: your chance! Pay attention to what others do, read their updates and react to them. If someone posts a question online, reply to it if you have an answer. Like a post, leave a comment on a blog article, share it with your friends, recommend resources or introduce people with each other. Recently, I got a message from someone I have been connected with on different platforms. We have not met so far yet have exchanged messages and opinions. The person wrote a rather long message telling me about an exciting project and the possibility to meet the project owner in Dubai as he happens to be there from tomorrow on. The issue: I left Dubai more than two years ago and have been living in Europe since! Try to keep up with any moves people in your network make. Double check on hard facts before you actually get in touch. If you move jobs, cities or countries, do update your online profiles. Send an e-mail to the “inner circle” of your network (i.e. the ones that you are in contact with regularly) and announce your move. How would people otherwise know what you are doing? If you need help, ask for it. If you have a question, ask. If you are looking for a job, say so. If you are looking for a business partner, announce it. If you want to meet someone, contact him/her. If you would like to connect with someone, ask if the other person wants that, too. Questions are the key! A network takes time to grow. The older you are the larger your network is, especially your business network. It takes time to build up trust and most people need more than one interaction to remember you as someone who could help them out. Remember the Golden Rule: Give before you take! Try to meet people in person – as often as possible. This is easy with people in your neighbourhood, of course. Whenever you travel to other places, do check if you know people who live there. Get in touch with them and set up a meeting for a coffee or a drink. After all, it is your personality that qualifies you for a job, not your online profile!